The 2nd annual Zach Kafka Memorial Day started with a Mites game between Big Stone Lake Area Waves and the Morris/Benson Area Storm. This was just a warm up for what turned out to be a GREAT DAY for Big Stone hockey. The Zach Kafka Memorial game was started last year in remembrance of Zach Kafka. Zach passed away in July of 2004 due to complications of an epileptic seizure. Zach was the goalie for the Big Stone JV team from 2002 to 2004. Each year Zach’s team is made up of players that actually played with Zach in the goal. With the exception of Goalie, Curtis Nelson. Curtis attended several goalie camps with Zach and is a personal friend of the Kafka family. Curtis is a sophomore at Kasson Mantorville High School and is the son of Kim and Terry Nelson of Kasson, MN. He is also the grandson of Lil Knutson and Henry and Suzie Nelson all from Ortonville. Zach’s Team was challenged by a team consisting of several players form around the area. The game began with a song (Precious Child) in remembrance of Zach. Players were introduced and the American flag was skated to center ice by a member of the Big Stone Figure Skating Club, Clarissa Blake. The National Anthem was sung by 12 year old Bonnie Sue Stolpman. Patty Haukos ran the video tape and the game was announced by John Stolpman and the game clock was run by Phil Blake. Sue Stolpman, Donna Valek, Lori & Nicole Gustafson registered players and accepted donations at the gate. Player registration included a Memorial Game Jersey sponsored by The Ortonville Independent, Pizza Ranch, Ortonville Dairy Queen, Conroy Eye Care, and Hill Motors. A few jerseys remain for sale for $25. If you are interested contact Dan Kafka at 839-3401. A fleece hockey blanket was raffled and the winner was Abby Daly from Morris. Last years game ended in a tie only to continue the tie after a 5 man shoot out for each team. The tie was broken as the challengers scored on a sudden death overtime shot by Jimmie Laub. 2006 proved to be a much more one-sided fight on the ice. Zach’s team got out to an early lead and never looked back. Leading the charge for Zach’s Team was Josh Benck with 5 goals and 2 assists, Brian Shelstad added a Hat Trick and 1 assist…including 1 Power Play goal. Luke Kafka, Cody Haukos and Nick Stolpman all added 1 goal each bring the total to 11. The challengers were led by Paul Tinklenberg of Willmar, MN. Paul scored 5 goals; Jason Oakes added 1 unassisted goal and Garth Haukos got the assist on one of Tinklenberg goals bringing the challenger team to total of 6. The entire atmosphere was a festive one over 200 people came through the gate for the day. People in attendance came to celebrate Zach’s life and enjoy a good day of hockey, while at the same time adding to the scholarship endowment. The Zach Kafka Memorial Scholarship Endowment was opened 1 year ago and had a goal of raising $10,000 to provide a minimum of $500 Scholarship to an area youth attending post high school academics. This event brought in over $2,500 and netted the scholarship fund after expenses, just a little over $1,600. With this contribution the scholarship fund is now “endowed” at just over $10,300. Scholarship applicants are now being sought. 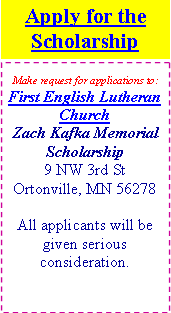 You can request your scholarship application from First English Lutheran Church or via e-mail from the web site; www.RememberZach.net. Since this fund is now endowed it does not mean that the fund-raising is over. Each year 5% of the fund balance will be given to the selected applicant or applicants. Donations will continue to be accepted at First English Lutheran Church as well as the 3rd Annual Zach Kafka Memorial Hockey Day scheduled for Saturday March 10th, 2007 at the Lee Community Center in Morris. A Night Golf (glow-in-the-dark balls) event is also being scheduled for August 18th, 2006 (Friday Night of Corn Fest Weekend) right here at the Ortonville Golf Course. The Kafka family would again like to thank those that continue to support this worthwhile cause.